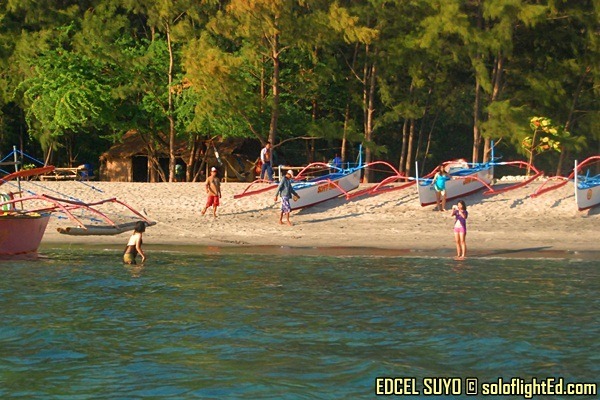 After taking our last dip in the waters of Anawangin Cove, we proceeded to another cove called Nagsasa. 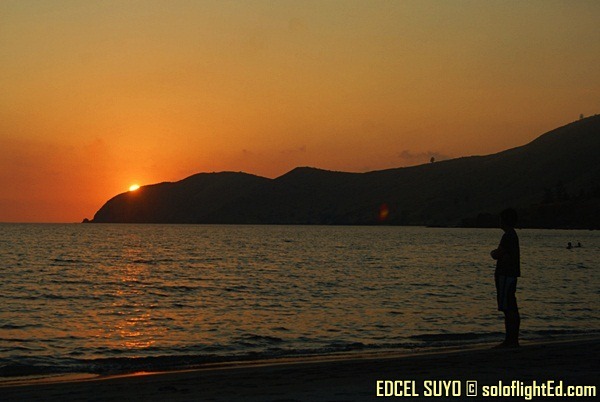 As described by others who’ve been here, Nagsasa Cove is a bigger and more secluded version of Anawangin. There aren’t as many people but it’s not as deserted anymore. 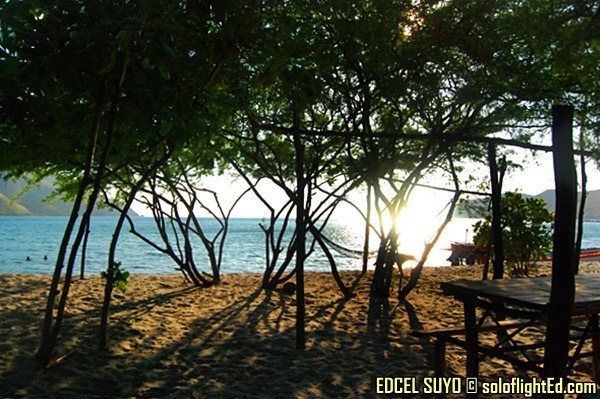 Travelers who have more time to spare head to this cove for a better and more relaxing escape. 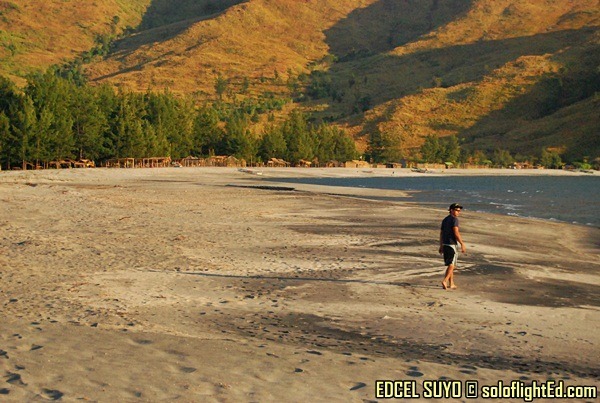 This has also been my primary destination why I wanted to visit Zambales in the first place. I’ve never really thought about how treacherous the water was going to be. I assumed that every trip would always turn out fine. Only then did I realize how lucky we were to have a perfect weather. Even so, outrigger boats don’t want to throw caution to the wind, else unfortunate events may happen. 30 minutes seemed fast and we arrived around 4:30pm. After settling in, we put up the tent brought by our new travel companions. 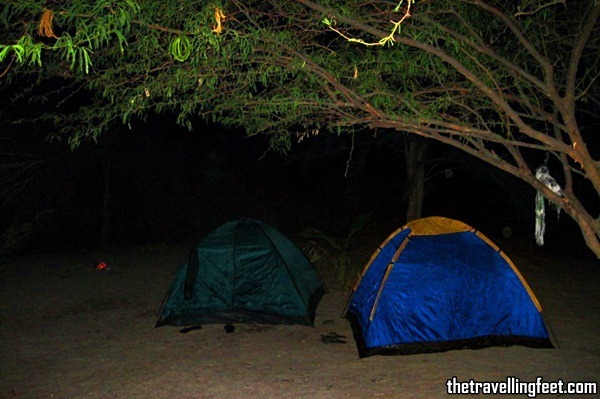 We didn’t have any camping gear available but even so, I would’ve settled sleeping under the stars – provided that I was all-covered with my blanket as mosquito bites would’ve ruined the ideal thought altogether. Still, I’m really thankful that they brought out a spare tent to accommodate us. We quickly set up our temporary house so that we could explore the vast landscape. Anawangin may have made me jump around and about but Nagsasa rendered me speechless. I couldn’t call it deserted but the surroundings seemed calm and peaceful. Then the sun set. I was too stricken by it that I forgot to use my tripod to finally practice a shot that I wanted to try. 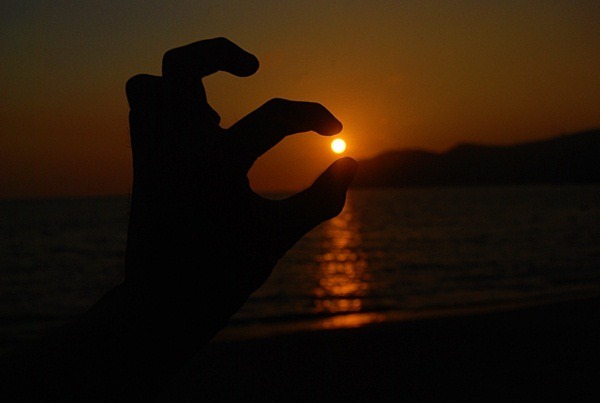 I pick the sun as if it were booger. – corny me. We set foot on the cove just in time to set up our tent, just in time to catch the sunrise. But definitely NOT in time to cook dinner! It was already dark and the rest of the campers had already eaten when we were still in the process of lighting up more wood. Having no electricity available, we relied on cellphone flashlights as our source of light. Ignoring hunger pangs, it still took us time to cook our food. Marinated pork bellies and fishes were waiting to be grilled and no matter how hard we tried using plastic plates to fan the coals, our fire wouldn’t light as much as we wanted. It even came to a point wherein we dropped by other campers’ grills so we could place our food there. Darn it, this what we get for not preparing. All the while the other travelers were already sharing stories and laughing like there was no tomorrow, drinking booze and singing ‘Kumbayahs’. If my scoutmaster back in grade school could see our situation, he would’ve shook his head in dismay. After a few more attempts to light our fire, I felt hopeless knowing that it still didn’t work accordingly. Then a sudden light bulb hit us all. 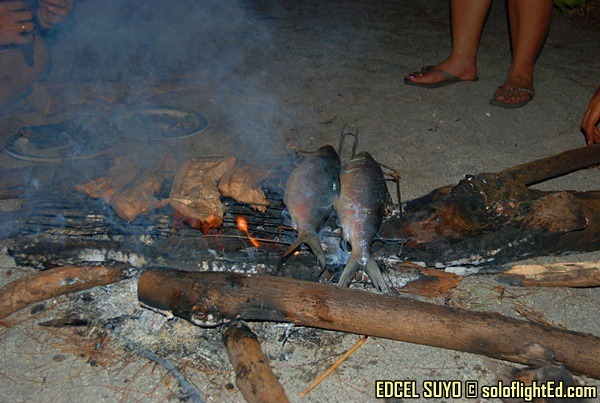 We bought bonfire wood from our boatman and decided to use that as our grill. Gas was poured and a match was lit; the end result? A stroke of genius. When one is hungry, every moment leading to food is heaven. We wanted to use the bonfire so we could gather around after eating. But it didn’t matter anymore. Our stomachs desperately begged for food so using it up wasn’t so much of a sacrifice at all. We had dinner at 8pm. Despite having our source of light coming from a lone cellphone bulb, we still ate with gusto. The food was good, if I may add; and no, not because we were too hungry. It’s something that I was really happy with. After we ate, my companions spent the remaining time at the beach. The moon was full and it helped that the stars filled the sky. But I didn’t bother joining them as I was too tired to even get up. Another case of SSB. Camping in Nagsasa cove made me ask myself: “When was the last time I went camping?” At the top of my head, I could barely recall when. While the rest of the world, continued with their talks at midnight, I hid inside the tent and lied down to rest. My shirt was filled with smoke from that night’s cookout and I didn’t change clothes as I dozed off to sleep all full and less famished. 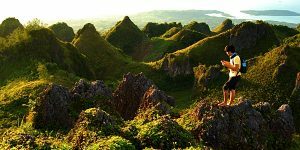 Note: There’s no electricity nor cellphone signal in Nagsasa. Better start early when you cook to avoid the hassles that this blogger and his companions went through. Only soloflightEd can turn the sun into a booger. 😀 You already! And I'm surprised you had difficulty in lighting fires. I thought it came naturally. Tee hee…. Nice post. Looks like a place I'd like to see but not stay in. I need indoor plumbing!!! @AJ: haha. couldn't think of any other caption. didn't want to sound too emo. lol. AJ… wait. had to reread your comment re: the fire. hahahaha. parang may hidden meaning ah. lol! Ang liit ng boat! 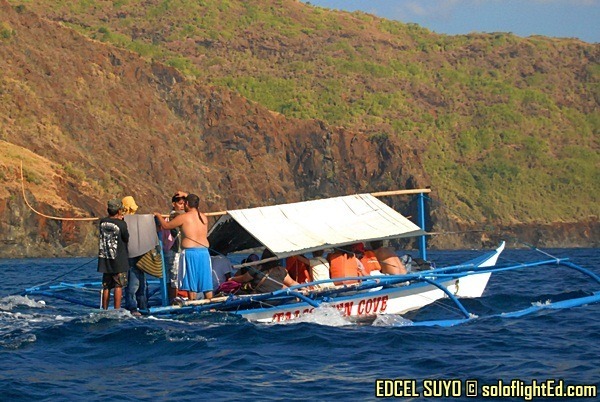 I have this fear kasi of small boats…as in muntik na ako mamatay dahil sa maliit na boat like this! LOL! But it seems like you enjoyed every bit of it…I love the photos, too! Oh my I would never go back to those islands. Not because I didn't like it, but because I got scared of the waves. Notorious. Sinama ko pa naman bunso namin before. hahah! Yari ako sa nanay ko. About the fire.. Same experience. Feeling ko napakahusay ko ng maglaro ng apoy nun. lol! Good thing supportive ang mom ko, dahil first time namin nag-camping she prepared adobo for us. Kanin na lang ang niluto namin. 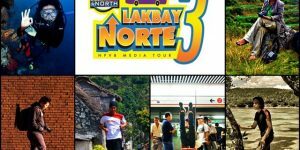 Mantakin mong may halohalo kaming natikman sa island na yun… ang galing! ang nice ng mga shots mo as usual. ang kulit ng chyng shot. hahah! @ding: yikes, looked really small. our boat was only good for about 5-6 people. had a near-death experience as well with boats. 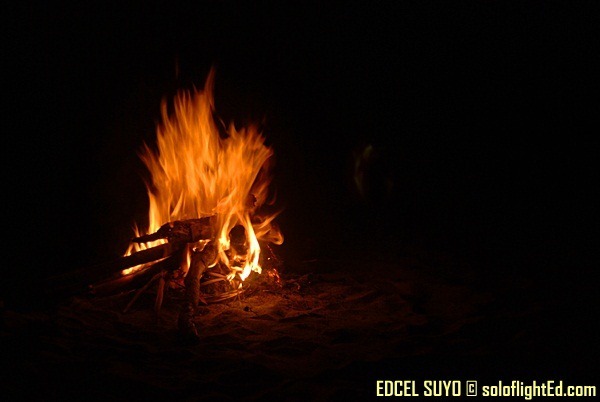 @mervz: haha, thanks indeed sa bonfire! haha. sayang di namin naabutan yung TV ah! @kura: ganun ba? nakakatakot pala talaga. nakupow, buti na lang you were safe with your bunso. hehe. pero saya talaga if our parents are supportive with our endeavors (endeavors talaga? hehe) haha. yep, nagpapakachyng kami nun. hehe. 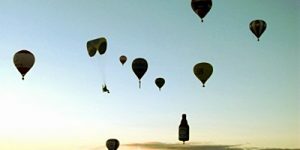 Great article and also great pictures. 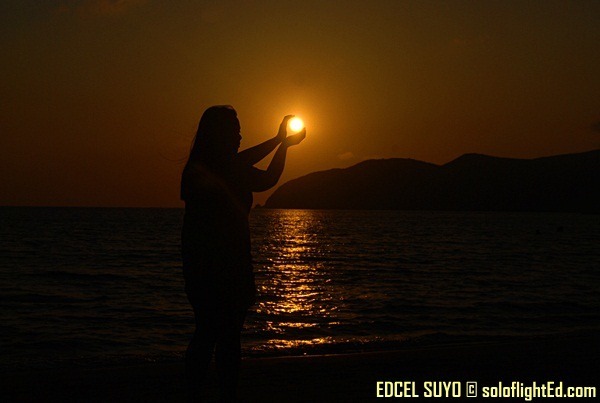 I especially love the ones where it looks like your holding the sun. Definitely an experience! hehe…. nice sunset shots! 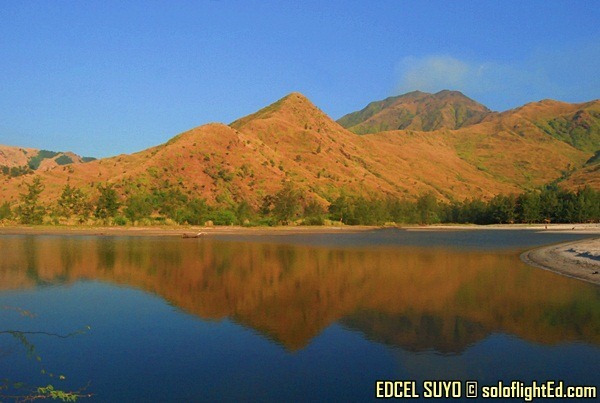 @bineysam: you should check it out, zambales has lovely landscapes! @lakwatsera de primera: haha, may gulay pa pala yun. sarap magluto ni Teresa (wifey ni Anton)! 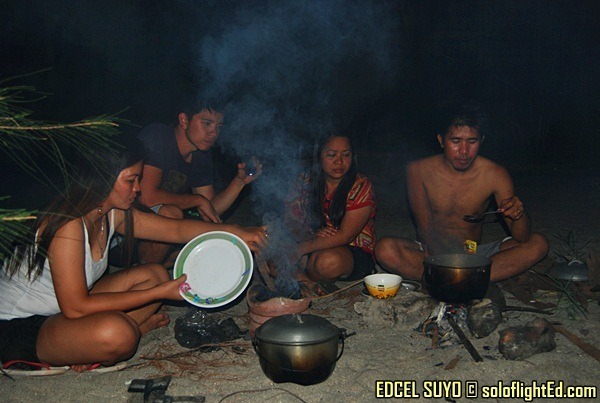 gusto kong magcamping uli sa beach. hehe. This looks like so much fun. The sunrise looks gorgeous and the water is inviting. Plus, I have to love the way you cooked that food. I probably would be fine with sleeping under the stars too. But I'm like you in that I'd want to be completely covered to avoid misquitos. Parang palubog na yung bangka ah.. hehehe..
at pagpunta mo ulit ng manila, i'll make sure mameet na kita! When we were in Nagsasa, kasama sa menu namin ang tuyo! i love cooking while in camp. Kakagana, tsaka aliw mag-improvise ng makeshift kitchen. @Steve: check out the Philippines Steve! We've so much to offer. haha. indeed, we don't want any bites when we wake up in the morning. 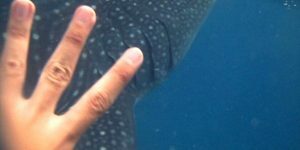 @Tripper10: yun din naisip ko when I saw it. haha. galing ni Chyng di ba? @micamyx: anong nasa red? eggs and tomatoes talaga! hahaha. ganda din ng links ng site mo. lol! kakapunta lang namin nung last wik ng march 2012, dami ng bago ngaun sa nagsasa, meron na electricity, pde pa magpacharge, 50 pesos per gadget, at magara ang CR, naka tiles!! at madami ng kubo!! sana wag na nila maxado damihan ung kubo at cr para ndi magmukhang crowded, at iwasan magbakod katulad sa anawangin, parang rancho na ang itsura sa dami ng mga bakod!